I began writing about six years ago. One day, when I was walking along a beach, suddenly verses started to go through my mind in rhyme. I decided that I should write some of these rhyming verses down, so when I got home, I took out a pencil and pad and started writing what I had been thinking about. Once I started writing, I could not stop and the verses turned into poems. One poem turned to ten and so on, to date I have written over three hundred. 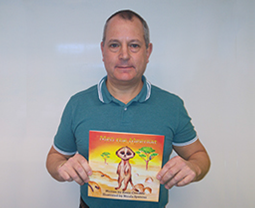 Over the last two years I have moved into writing children’s books, which I really enjoy and have recently written more Meo the Meerkat stories waiting to be published. Other children’s books are planned and I am looking forward to sharing more of my stories in the years to come.